.....*as voted by the dog owned by the best friend of the aunt of the son of my milkman. 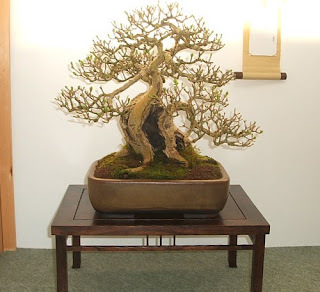 Below is a sequence showing some of the work undertaken during March's workshop, this time by Dave Y on Brian's Hornbeam. I guess it will crack about........ here!! Work in progress.....why should plumbers get all the fun? 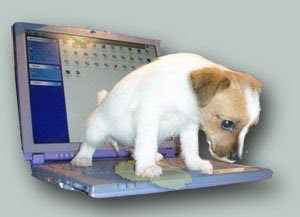 Dave Y 'hides' behind his work!! 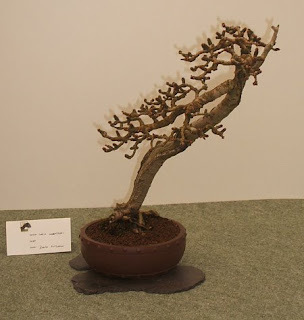 The 'finished' tree...... with no cracks? Simon enjoying the fruits of his labour!! This months meeting turned out not to be a workshop per se but involved an impromptu appearance of Simon Temblett. As most of the committee (including myself!!) 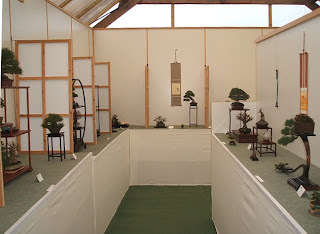 weren't there Les persuaded Simon (who had come as a guest of Dave Y) to pitch in and do a critique come discussion on some of the members trees on display. 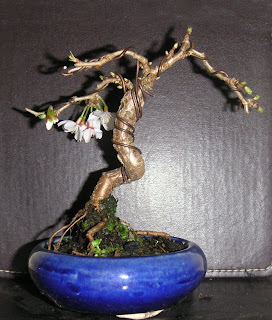 This months meeting is another chance to get repotting and/or generally working on your trees pre springs new growth. 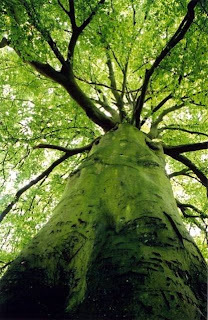 So bring a tree or two if you dont want Ian to be unhappy!! 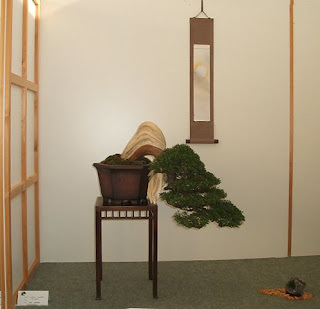 Plus Dave Y has indicated he will bring his laptop along to allow non attenders to see all the photos he took at the BSA show at the beginning of the month. 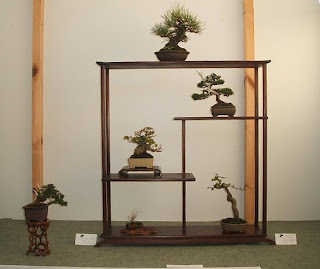 A selection of other trees from the show. 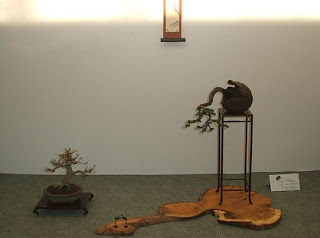 As some may have noticed Anthony has started to 'show' his bonsai friends some of the collected material he has available, on a blog site -see Urban Yamadori under 'members sites' on the right hand side. At the moment he is only showing a few that have been photographed - the number and variety will undoubtedly increase in the coming weeks. As a landscape gardener he often comes across interesting 'finds' that need liberating. So check it out and remember to pop back often, you never know when that little stump (??) you've always been craving may turn up!!! Thanks to Les for the photo's. This may be a bit 'anorak-ish' but you might be interested to know that the hit counter I added a few months back provides statistics on visitors to the blog. 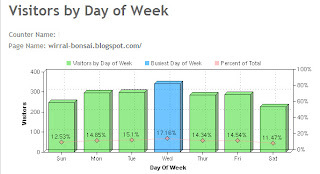 My guess for most popular time for visiting the blog would have been the weekend or one evening maybe.....But the most popular time for visiting is....................Wednesday, between 2-3pm!!! Why aren't you all at work???? .....there again........maybe you are, and this is a little midweek pick me up! Don't let the boss see you though!! 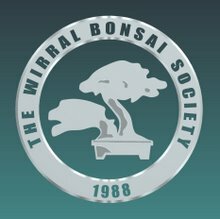 As discussed at our last meeting and as highlighted in the message board, Green Dragon Bonsai have been granted the concession [ ;) ] for selling bonsai supplies at our meetings. Mark Kennerley will be joining us monthly (?) 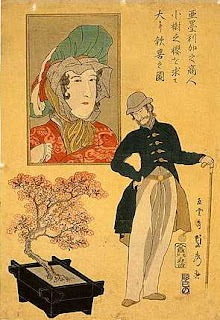 and presumably can be tasked with finding anything bonsai related. If you have any items that are required for next Wednesday's meeting email Mark via the link below and I'm sure he will be glad to help. 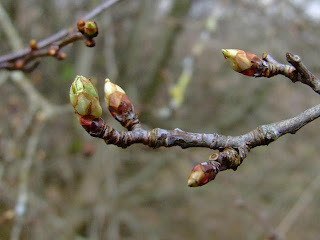 By way of sharing the joys of spring, (or showing off, to you and me!!) 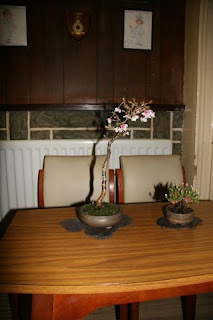 Anthony has sent me a picture of a flowering cherry from his collection -so that his fellow club members can enjoy it too. I believe congratulations are in order for Lee [Best Chuhin (?)] and Ian [certificate(s) of merit] following this weekends BSA show at Willowbog. 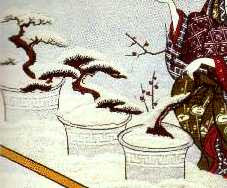 Click on the link above for a journey into the visual history of bonsai pictures- as depicted in scrolls, woodblock prints and paintings.